Ever have one of those mornings where you just really want a cup of coffee NOW? I know I've had that a time or two, heck I've even had it in the middle of the day. And waiting for an entire pot to brew just isn't going to happen when the mood strikes. That's what makes the Capresso On-the-Go Personal Coffee Maker so awesome. You can brew a single serving of coffee anytime you like day or night in a matter of minutes. I've tried using the K-cup style coffee machines and I just never really found one that I really fell in love with. It seemed like after some time it stopped working right and I would end up with grounds in my cup. When I heard about this personal coffee maker I was pretty excited to try it out. I like that it comes with the perfect sized travel mug so I knew right off just how much coffee was going to come out. And it also gives me the option to use ground or soft pods for my coffee choices. Another nice benefit. I love that the filter that came with the coffee maker can be removed to be cleaned and reused over and over leaving no waste behind like the K-cups. The coffee brews pretty quickly in just a few minutes which is great if you are in a hurry. I really like the way the coffee tastes brewed from the coffee maker too. It's not watered down, and it's not too strong. I've had both extremes with others I've tried so I really like that this one makes it just right for me. • Full stainless steel housing for superior strength and style. • 16-oz stainless steel thermal travel mug, perfect for those on the go, or those wanting a quick single cup at home. • Use included travel mug or your own mug (up to 7” tall). • Heats up quickly to the perfect temperature of 200°F for properly extracted coffee. • Brew with ground coffee or soft coffee pods. • Large shower head for perfect saturation and extraction. • Brews in less than four minutes. • Removable permanent filter is easy to use and clean; eliminates the need for paper filters. • Travel mug, coffee filter and removable filter basket are dishwasher safe. • Travel Mug fits snuggly in most car cup holders. 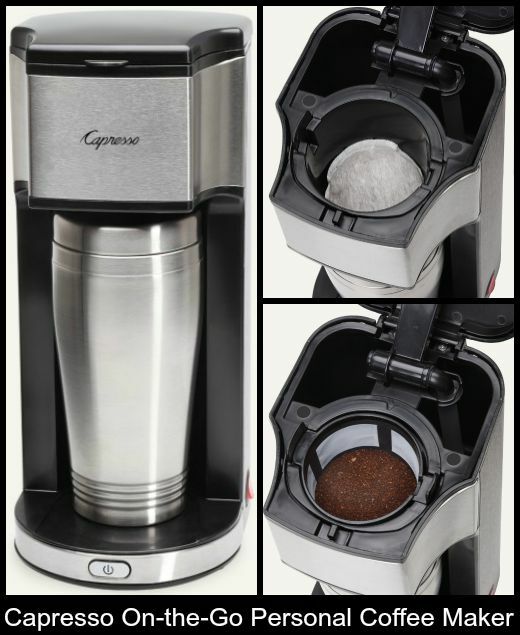 Buy it: You can purchase this and other great beverage machines on the Capresso website. I really like that! I could use it to make a cup of coffee and take it to work.